Underground: Take red line 14 towards Mörby Centrum and alight at Universitetet. Bus: Bus number 50 from central Stockholm (alight at Universitetsvägen) or bus number 540 from north and northwestern suburbs (alight at Universitetet). Train: Roslagsbanan from Tekniska högskolan. Car: Follow E4/18, Norrtäljevägen northbound. From Arlanda Airport: It is easiest to take the Express train, a 20-minute ride, or the Airport bus, a 35-minute ride, to the Central Station and then take the underground from there. 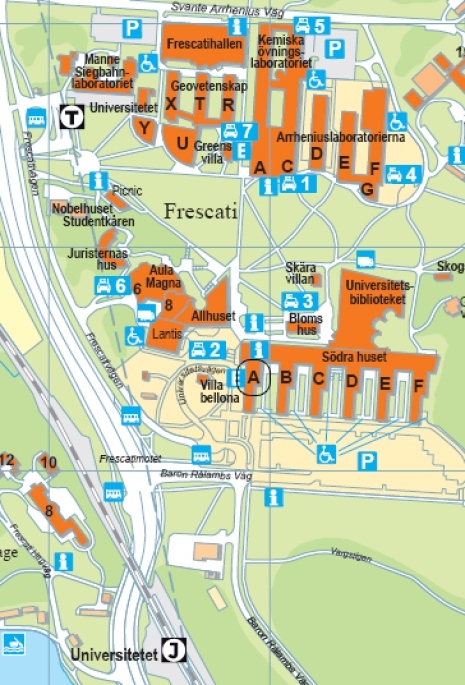 IIES is located on the 8th floor in the A-building of Södra Huset. N.B. If at all possible, please avoid sending registered letters. For individual members of the IIES, please see Staff. If you have comments about the IIES web, please contact the editor at hanna.weitz@iies.su.se.